Fascinating tour of Las Vegas magician/author/collector, Gary Darwin's, amazing house full of magic and memorabilia. I like this DVD a lot, if for no other reason than I could show my wife that I was far from being the most crazy, obessed and cluttered collector of magic in the world. After she saw Darwin's wall-to-wall, floor to ceiling, room-to-room magic collection, she briefly shut up about how much "magic crap" (her words, not mine!) I have around the house. This effect on your spouse is well worth the price of the DVD. But you will also get to see a lot of interesting memorabilia and apparatus as Darwin leads you from room to room, picking up and discussing the most interesting items in his massive magic stockpile. I wish he spent a bit more time on some of the items, and that we got a closer look at others -- don't just tease me by showing me the lock on an original Goldston Locked Book... let the camera zoom in, open the book, and show me some details! But that complaint aside, I still enjoyed this tour, and I suppose if I got as much detail as I wanted, I'd still be watching it three days later! You get about 2 hours worth of footage, which combines the tour, Darwin's anecdotes about famous magicians he has met (and he's met a lot of magicians) and also some pretty good tricks which Darwin teaches in each room he visits. Good value, and a good addition to any magic video library that cares about magic history and character, and not just trick learnin'! 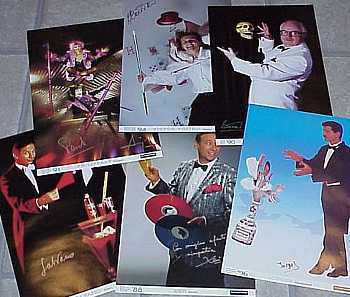 These are from the series of master magician posters put out by The Magic Hands (Germany) in the 1980's and early 1990's. They are autographed by the performers. Posters are 11"x17" and full color, with a banner including the year issued, the performer's name and native country (in German). This set contains 24 different magicians from all over the world, depicted to show their style, and each boldly autographed by the performer. 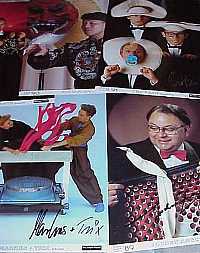 Poster set: Autographed Magicians of the World #2 (24 posters) These are from the series of master magician posters put out by The Magic Hands (Germany) in the 1980's and early 1990's. They are autographed by the performers. Posters are 11"x17" and full color, with a banner including the year issued, the performer's name and native country (in German). This set contains 24 different magicians from all over the world, depicted to show their style, and each boldly autographed by the performer. This is a fun set of classic magic posters, scaled down to just 6 inches tall. They are printed on a durable, hard to rip/tear, thin flexible plastic, so they will last much longer than ordinary paper stickers. 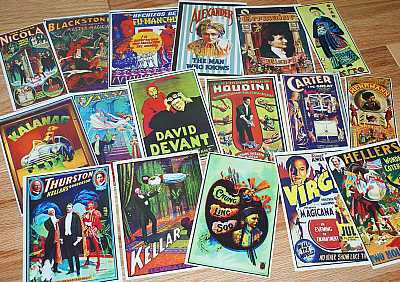 This set contains 17 great poster replicas: Thurston, Okito, Alexander, Kalanag, Herrmann, Virgil, Germain, Houdini, Nicola, Carter the Great, Devant, Chung Ling soo, Kellar, Fu Manchu, Heller (okay, I had to look him up...), Jansen, and Blackstone. The mini-posters are backed with peel off adhesive, so you can stick them on your magic cases, magic binders, anywhere you want to scream magic. (Won't your wife be happy when she sees the new look for the fridge!) If you have a magic room, (and what magician doesn't) and you are handy, I could see someone converting an old scratched up coffee table into the ultimate magic coffee table, covered with these colorful poster replicas and a coat of clear varnish. Whatever you decide to do with them, these stickers are a must-have for any magician who is proud of our Art! This is a double set of classic and contemporary magic posters, scaled down to just 6 inches tall. They are printed on a durable, hard to rip/tear, thin flexible plastic, so they will last much longer than ordinary paper stickers. These come in two different sets, but here they are combined together into one SUPER set of 32 different poster replicas. The classic posters include: Thurston, Okito, Alexander, Kalanag, Herrmann, Virgil, Germain, Houdini, Nicola, Carter the Great, Devant, Chung Ling Soo, Kellar, Fu Manchu, Heller (okay, I had to look him up...), Jansen, and Blackstone. And also a couple of classic magic ladies of yesteryear -- Adelaide Hermann and Ionia. The 32 different mini-posters are backed with peel off adhesive, so you can stick them on your magic cases, magic binders, anywhere you want to scream magic. (Won't your wife be happy when she sees the new look for the fridge!) 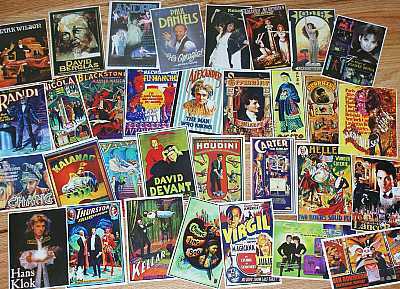 If you have a magic room, (and what magician doesn't) and you are handy, I could see someone converting an old scratched up coffee table into the ultimate magic coffee table, covered with these colorful poster replicas and a coat of clear varnish. This SUPER Set of 32 stickers, new and unused, is offered at a discounted price compared to buying the two sets separately. Save a little money and get even more magic into your life!